The heavens delivered a bit of scientific vindication to Yale professor of astronomy and physics Priyamvada Natarajan recently, when her 20-year-old theory about winds from distant black holes was proven correct. 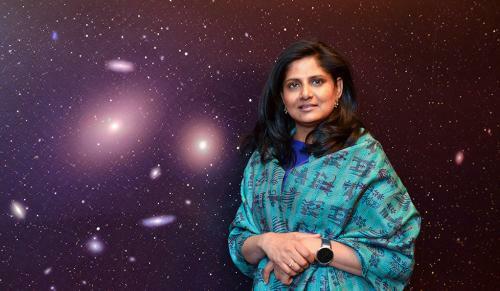 In 1999, when she was a graduate student at Cambridge University, Natarajan predicted that cosmic winds driven by a black hole could potentially carry gas and other star-making material thousands of light years away from their host galaxy. The paper containing this prediction was written with Steinn Sigurdsson, who is now a professor at Penn State University. Natarajan’s theory was right. A research group led by astronomer Mark Lacy of the National Radio Astronomy Observatory in Virginia recently reported the observation of just such a wind flowing away from a type of supermassive black hole known as a quasar. The researchers found evidence of winds blowing hundreds of thousands of light years away from the host galaxy. YaleNews recently talked with Natarajan about the confirmation of her theory. What follows is an edited version of that conversation. What were the circumstances surrounding your original prediction? Was this part of your graduate research? Yes, it was part of my graduate research, though not formally part of my Ph.D. thesis. For my thesis, I developed one of the first comprehensive frameworks for understanding black hole growth in the larger context of cosmic structure formation. Our theoretical model successfully coupled these two processes — the growth of black holes and the formation of stars in galaxies — and predicted that the properties of the dark matter halo hosting all of this activity were critical. At that point, in 1998-99, it had just been discovered observationally that there was a correlation between the mass of dead black holes and the mass and luminosity of stars in the inner regions of galaxies that hosted them in the nearby universe. This was a super-exciting result that spurred many of us theorists to think about the possible origin for such a correlation. What did you come up with — and how did you get there? The energy released from matter falling into black holes is actually sufficient to disrupt an entire galaxy if tapped. I found that in order to establish such a connection the black hole somehow needed to modulate star formation in the galaxy it was sitting in the center of. But the tricky issue was one of physical scale. A black hole is incredibly compact and the stars, even in the inner regions of galaxies, are far away from it. The question I was engaged in exploring was how this energy from matter falling into black holes could be tapped from small scales near the black hole to the scales that the stars accumulate on. One way I came up with was for supermassive black holes to drive an outflow that could extend to large distances from the heart of the galaxy. I then worked out the physics of such outflows and showed that this link between physical scales and coupling between the black hole and the stars could be feasibly established. The physics definitely permitted — and in fact predicted — such a coupling. Another important consequence of such outflows is the possible fate of the gas that these winds sweep up. We predicted in 1999 that the swept-up gas would fragment and form stars, creating a population of dark matter-deficient galaxies and globular clusters. This was and is counter-intuitive to our standard understanding of how galaxies form. My colleague at Yale Pieter van Dokkum and his collaborators have very recently started discovering extremely dark matter-deficient galaxies — so if such a population does exist then we’d need unconventional ways like fragmenting quasar outflows to possibly explain them. I am back to working on this problem to explore and understand better this new mode for forming galaxies, so ask me again in six months! Others in your field continued this line of study in the years that followed, clearly. What was the specific prediction you made? The kind of coupling I predicted has since been referred to as feedback and is an active field in galaxy formation today. While looking for observational signatures for such outflows driven to large scales I realized that there was a unique and unexpected radio wavelength in which these could potentially be observed. It is the so-called Sunyaev-Zeldovich effect, which is produced due to the hot electrons scattering off the all-pervasive relic radiation from the Big Bang and motion of the outflow driven by the growing black hole. I predicted that these quasar outflows would be unconventional and unanticipated S-Z sources. Typical sources are clusters of galaxies that contain a hot ball of electrons in their centers that the relic radiation scatters off. Why do you think it took this long to confirm your prediction? There were very few instruments at that time that could even detect the S-Z effect and the handful that were around were not all that sensitive. It was a prediction that I knew would become feasible in 10 or 15 years, as instruments like the Atacama Large Millimeter Array (ALMA) were already in the planning stages. Were you aware of Mark Lacy’s research as it was ongoing? What was your initial reaction? I was super excited to hear of this observational detection by Mark Lacy’s group. It was wish fulfillment — this is a dream come true for every scientist, particularly theorists — that a prediction is observationally verified and validated. I cannot even describe in words the kind of thrill and satisfaction one feels when this happens. It’s totally cool. Now that it has been proven, what is the overall significance of this discovery? This was a missing piece of the puzzle in our understanding of how, precisely, feedback operates and how star formation is modulated by black holes in the most massive galaxies. Black holes, we now understand, play a critical role in structuring the universe by impacting galaxy formation. Also, this discovery shows that there is much more gas physics to understand, in greater detail, in the universe. Now that these outflows are real, they might hold the key to an entirely new mode of galaxy formation — and I think this will nudge the field more generally into exploring many new pathways and environments in which galaxies can form.